Today I would like to show you my latest Acrylic Pour. I call it "Catch the wave". 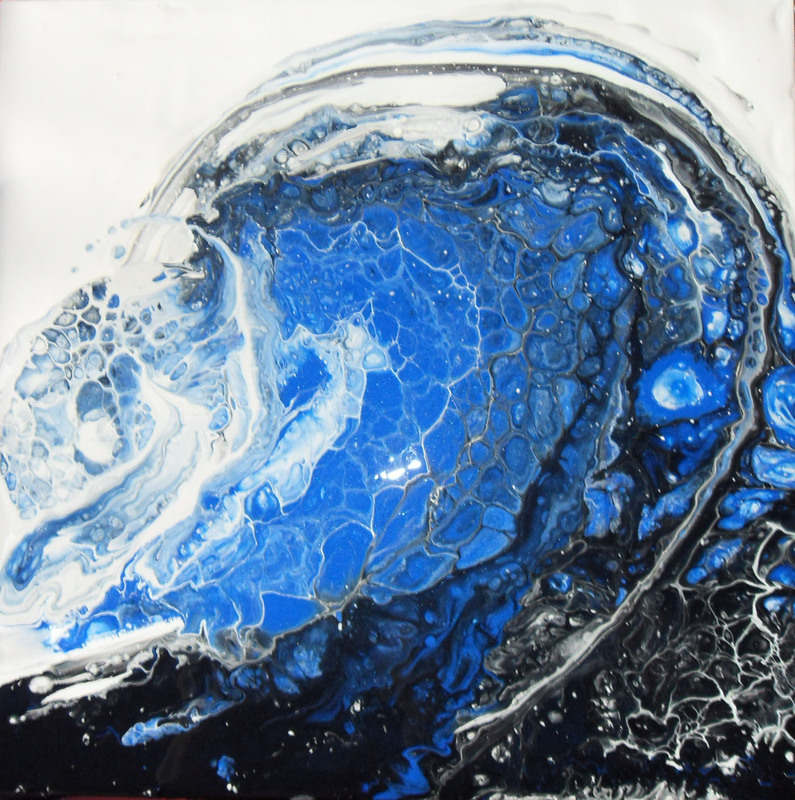 This acrylic paint pour is achieved with acrylic paint, paint extender and silicone oil. This is a 12"x 12" piece using a pour and swipe technique. Thanks for dropping by and hope you'll be creating in your crafting space soon! 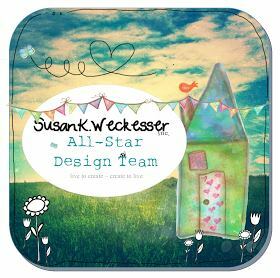 Please drop by my blog for more creative fun! I love to play with resin and especially the drippings that come off the original art piece. In this case, I have sparkly and shimmery metallic micas. Resin makes great embellishments for cards and scrapbook pages as it can lye flat. I used the mica powders with ArtResin as directed 1:1 stirring for the complete 4 minutes. 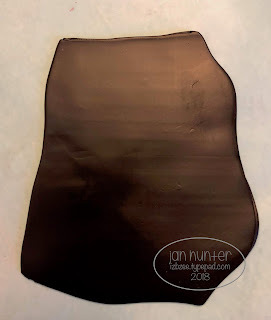 I used very little mica to color the resin for an entire 10x10 canvas board. 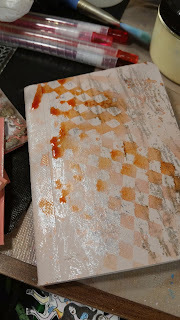 After I had let the resin cure for 12hrs I could then peel the resin off the parchment paper which was in place to catch all the drippings. I used these left over bendy resin skins to cut into the shape of butterfly wings. I then let cure another 24hrs and glued them to a drawer pull. The tail lifts up. I imagined this to be used as a zipper pull or hanging on a backpack. Hi, Jan here. I wanted to share this quick project with you. Every once in a while you need a new key chain.... here's mine inspired by all of the magnificent sunsets we've been seeing in recent days. Prep the wood. The wood I used is untreated -- no finish (therefore no toxic fumes when you use the woodburning tool). 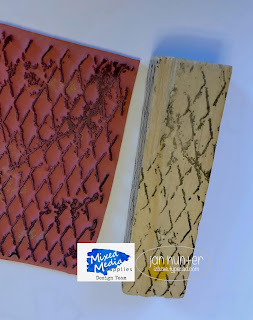 If it needs a little sanding for a smooth stamping surface, do it now. Clean as needed. 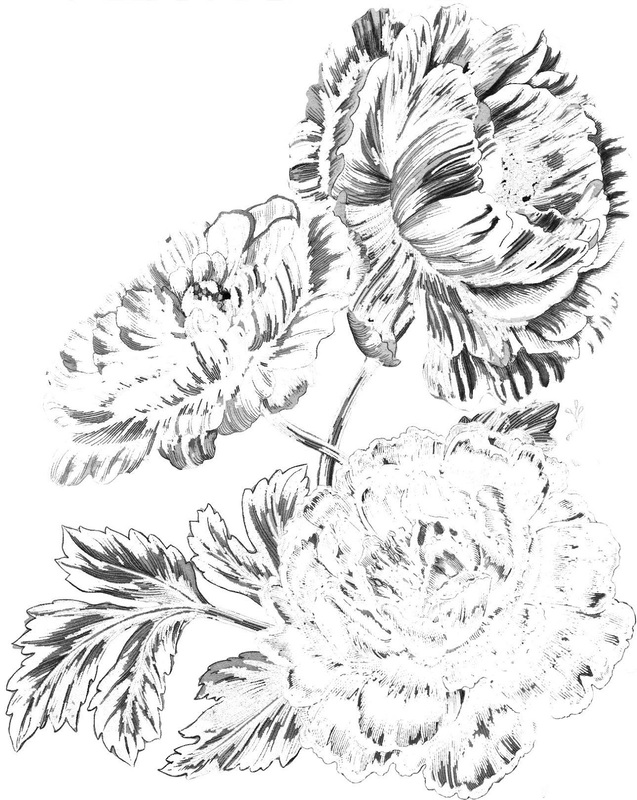 I can see so many possibilities with other stencils and stamps for all holidays and these becoming ornaments. Hope you have set aside some creative time this weekend! Thanks for stopping by. 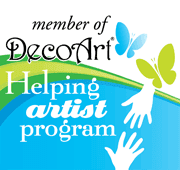 Please feel free to drop by my blog for additional Mixed Media and other projects. Today I would like to tell you how I made this Journal Cover. I cut my gears out first and laid them down to paint. 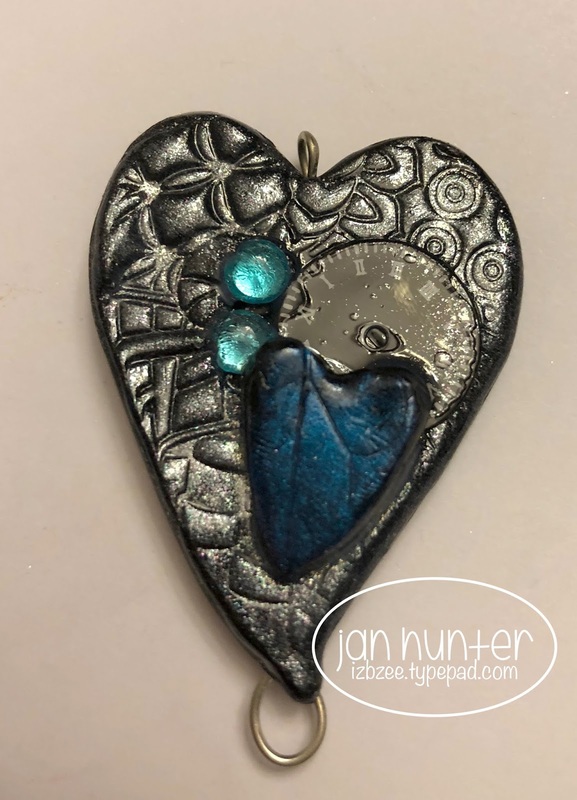 I used perfect pearls patina silver, green and blue. I dabbed on the powders using a gel medium. Next, I pulled out some real cinnamon, again using my medium to stick it to the gears. 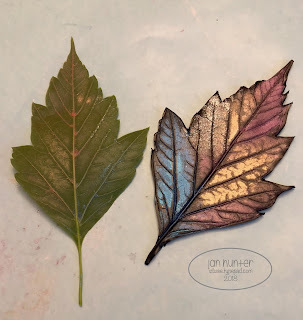 Lastly, I pulled out my mixed media supplies mica powder in copper to add the shiny bits. 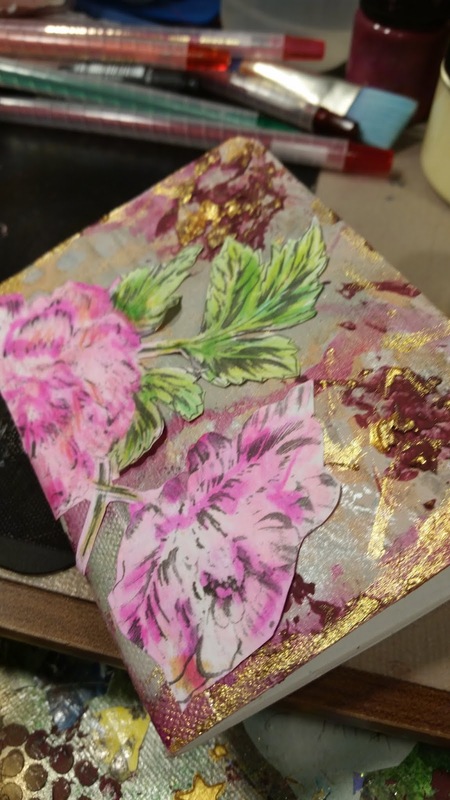 I let that dry and started with my journal cover. I collaged some vintage papers/text to my journal cover. Then I got my stamps and stencils out and in black ink, I stamped the chain link fence stamp and used the numbers stencil. Then I took the distress inks and went to town. Firebrick red, Broken China oxide, and Peacock feathers distress inks. Then I used antiquing cream sparingly on the base. I took a black Pitt pen and made brick like marks randomly. Then I laid my dried gears and I used double-sided foam tape to prop up some of the gears of the background. I hope you enjoyed today's tutorial for inspiration for your next steampunk gears journal cover. Hi everyone. 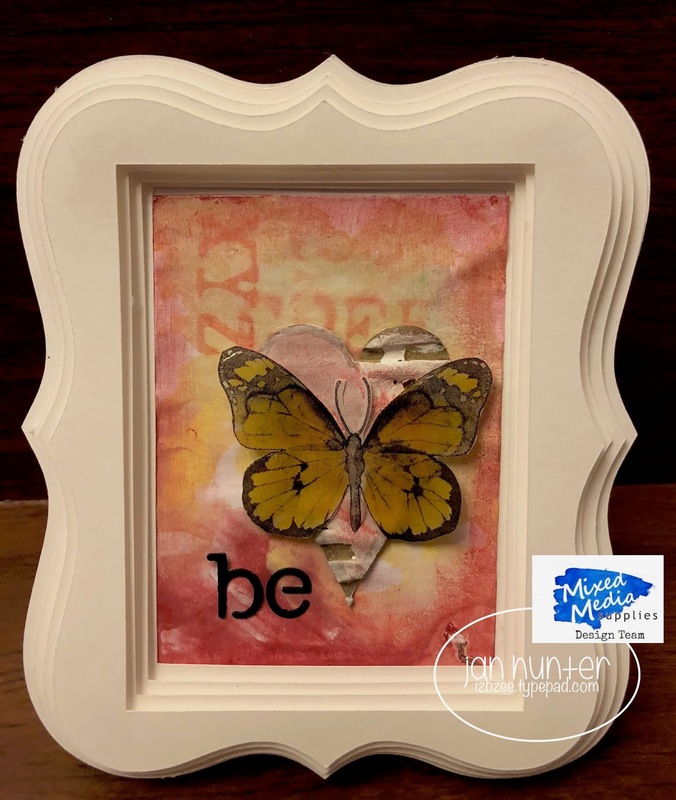 Jan here to share this mixed media piece. This piece is ATC size, loaded with mica and involves an impression of a real live leaf into the clay. 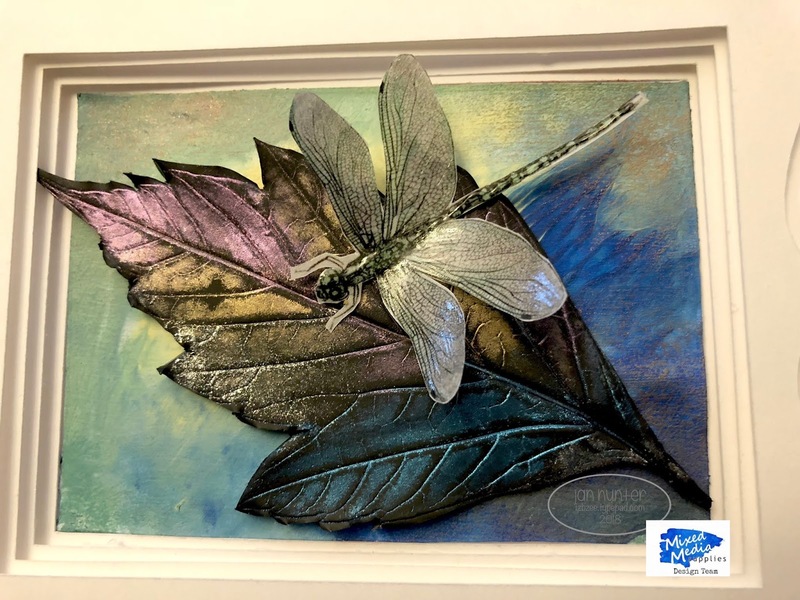 The dragonfly is a Mixed Media Supplies digital stamp printed on vellum. Condition clay as directed by the manufacturer, beginning at 1 and finishing at 3 (using a pasta machine). If you need to, clean and dry the leaf to remove any dirt or chemicals. 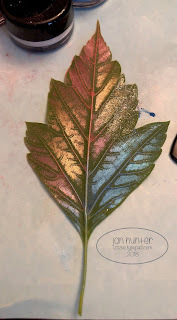 Apply a generous coat of mica powder (I used 3 colors) to the back of the leaf (there is more texture there). Place the leaf on the clay with the mica facing the clay. 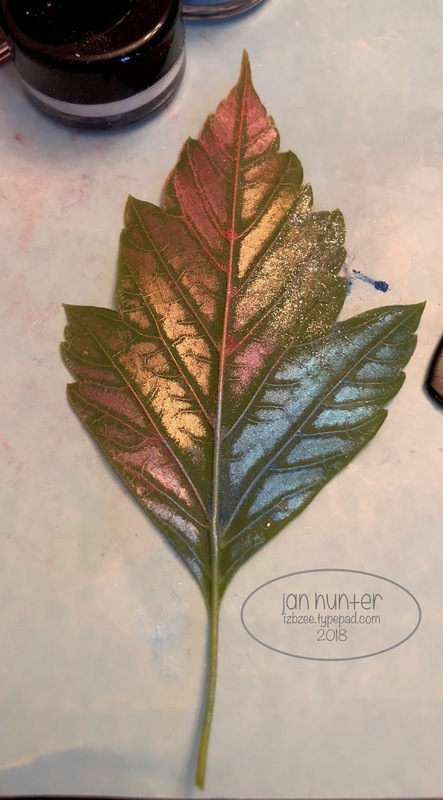 Using the acrylic roller, roll the leaf lightly into the clay. Leave in place and trim the excess clay using the craft knife. Remove the unneeded clay and remove the leaf. At this point bake the clay according to manufacturer's directions. Let cool and remove from baking plate. 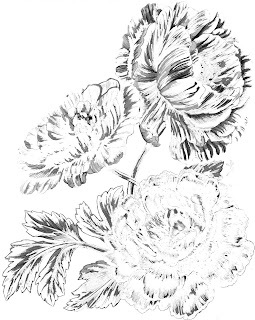 Print the dragonfly on vellum in the desired size. Color on the wrong side (non-printed) as desired using Tombow markers. The color is transparent on the vellum. Cut as close to the outside lines as you can. Apply a light coat of the glossy resin to the printed side of the dragonfly. Set aside to dry. Assemble the background. Because my gelli print is done using copy paper, I add an extra backing of cardstock the same size as the ATC (2.5 x 3.5 in). Then I add another backing that frames the gelli print (3 x 4). Adhere using your favorite method. 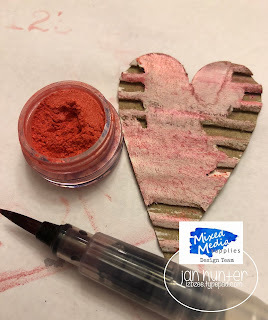 I run the gelli print through the Xyron for edge to edge coverage. Adhere the clay leaf to the gelli print, add the dragonfly and frame as desired. Thanks for stopping by and taking a peek today. 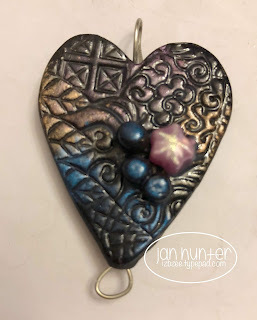 Please drop by my blog for more mixed media ideas. Hoping you have some creative time on your calendar this week! Nurture your heart! Hi everyone. Jan here with a fun upcycled bit of porch decor. I upcycled another side piece of a deconstructed shelving unit. 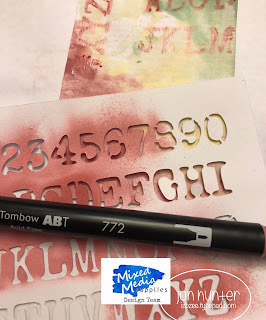 The Crackle background stamp from Mixed Media Supplies has always been a favorite of mine. And even on this big piece, it added just the right touch. Prep the wood -- I sanded to give the surface a little more tooth for the paint. I used a based coat of Wrought Iron - let dry thoroughly. 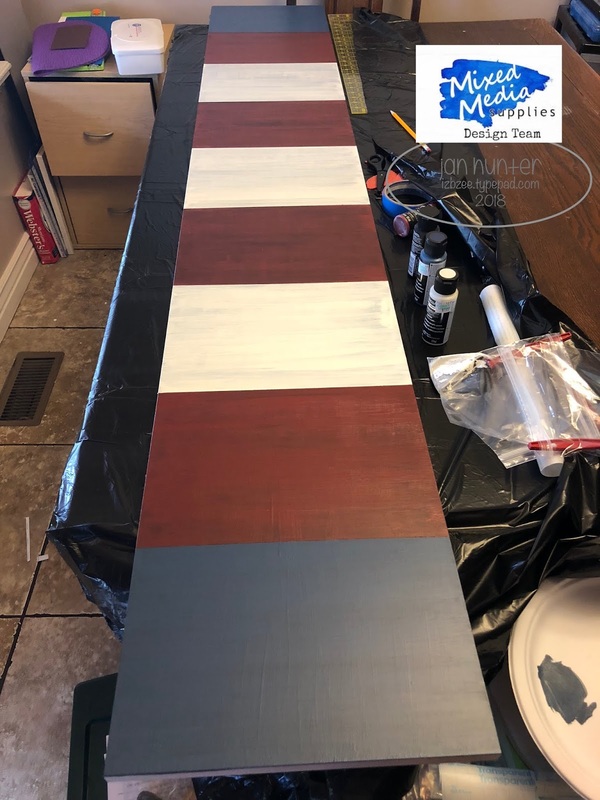 Mark off sections for the "stripes" of color. 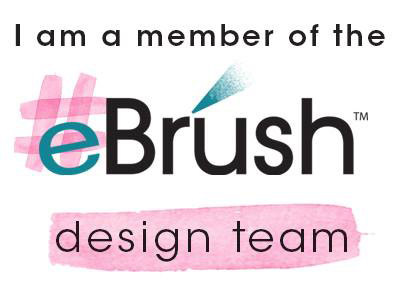 Dry brush your colors on. Let a little of the dark gray wrought iron color show through. Let dry. If desired apply another light coat and let dry. 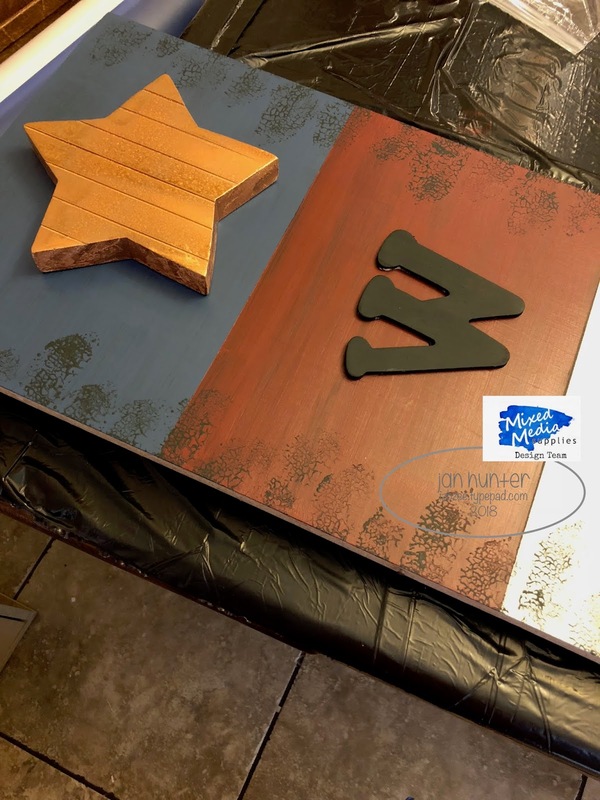 Base coat your letters, mine are 4 inches tall and about 1/4 in thick (Hobby Lobby) The star is about 6 inches in height and has some texture. I basecoated with the antique white and then applied a coat of Krylon's Hammered copper paint (be sure to apply in a well ventilated area and let dry thoroughly. Glue the letters and star to the painted base. Let the glue dry. 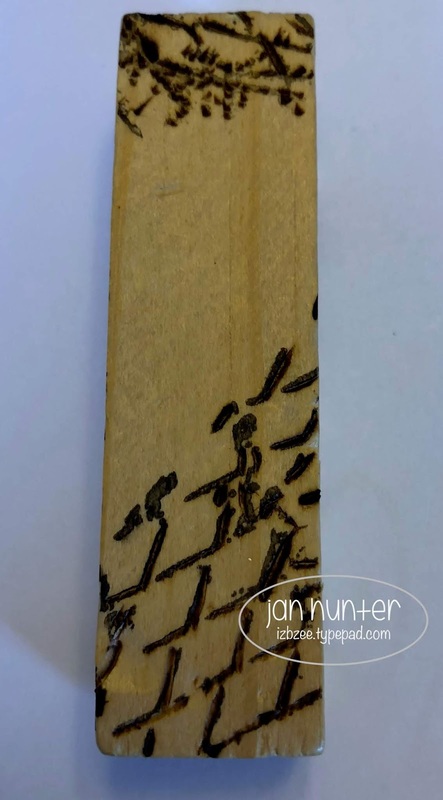 For final touches, brayer a light coat of paint onto a portion of the crackle stamp, press lightly to the edges of the board as desired. It's a nice touch and added just the right amount of texture. Spray with several light coats of sealer, letting dry between coats. 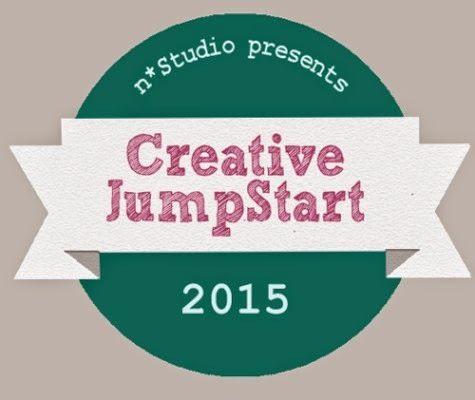 Thanks for dropping by today and hope you'll set aside some time this week for some creative fun! Would love for you to stop by my blog to see more ideas using Mixed Media Supplies stamps and more. I felt inspired by the many butterflies and dragonflies I have in my yard. I printed my stamps onto the plastic sheets and cut out my focal image. Next, I colored with my alcohol markers on the opposite side that I printed on. I used V17, BV02, BG15, B26 Copic markers but you could use sharpies too. I fussy cut my image out and folded it in the middle to give open wings. I also cut out an image from cardstock that I also used in the background from DCWV. 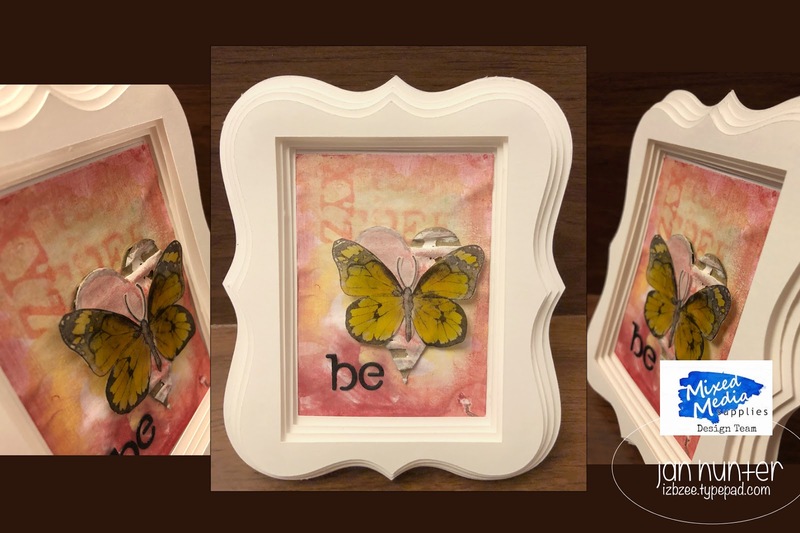 I used wet glue for the butterflies and double-sided tape for the layered cardstock. That's it another quick card! I start with a trip to the Dollar Store. 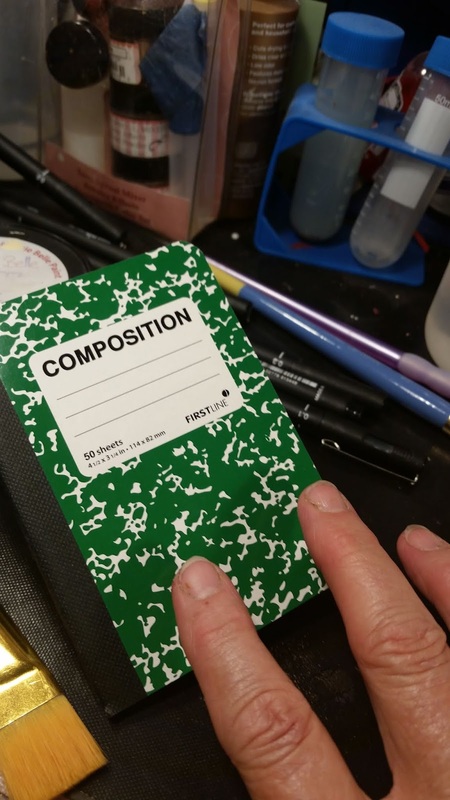 You can purchase three of these mini journals for a dollar. I used this digital image to use as an overlay on my project. I used chalk paint to do my background. I then sprayed some glitter mist on it. 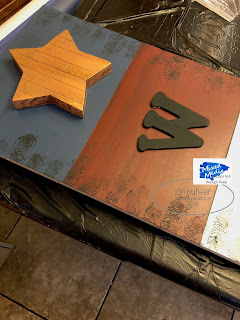 I used a mix of chalk paint and sealer to coat over my cut outs. 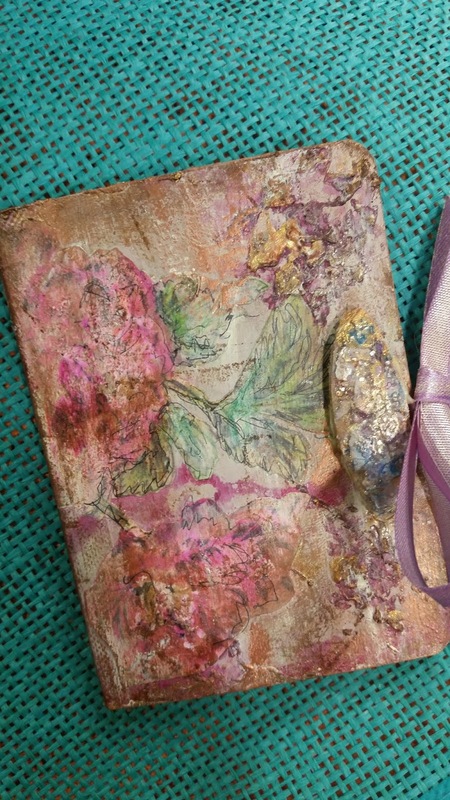 I love my little book and will share the clasp instructions at a later date. Thank you for visiting! I have a new addiction! surprise ..surprise right? Well not only did I make something out of resin but seeing others making resin geodes inspired me to make my own. The best part is I took the best out of all the video time I watched and put it into this piece. I did record the majority of the pouring. What I do not show is the caulking with a caulking gun and silicone tub and tile. 100% silicone. So here is Tiger Woods lining up a putt. I put down some saran wrap on top of the glass frame. Then I caulked with a caulking gun in the shape I desired including the center where I do not want the resin. Next, I layered three deep making sure to adhere to the next layer without holes. I let this dry overnight and the next morning I could pick it up. So I prepared the glass to accept the resin and to do this I placed a mylar plastic stencil material on top of the glass frame and I used double-sided tape to adhere it to the glass flat. When I lay down my silicone mold to the mylar matt I secure the edges with more silicone to ensure zero leaking. Like caulking a tub around the edges. I purchased some glass beads from the dollar store. I heated them up in a frying pan for five minutes over medium heat covering it with a lid and then I shocked the glass in ice cold water. Next, I took a hammer to them and made different sizes. These will be used in the center. after the next layers go on you can only see the first layer in spots where I added clear or not fully mixed resin color. Here you can see all but the final coat of clear before taking the silicone mold off. Here the mold has been taken off. Each layer was done in the same manner. Each color mixed for the next layers was not mixed completely meaning I just added the resin to the color and gave it a swirl before pouring. Four layers in total and four days later. Next, I added the glass to the center. I took some blue glass and colored it purple with blue and red alcohol inks. The inner glass is not colored but a light coat of resin applied to make it all stick. To finish it off I will be adding black onyx to the outer edges. Select a stencil. 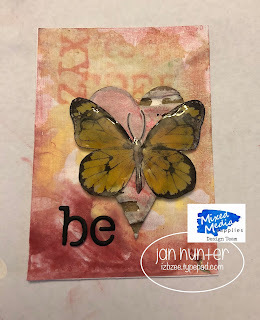 My stencil is a new digi from Mixed Media Supplies. I'm so excited to get to share the Alpha stencil. 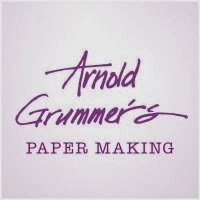 There's also some numerals in the digi and it's created at ATC size for perfect use on these mini-sized canvases. Challenged to use some cardboard for another project, I cut a few hearts and removed a bit of the paper exposing the corrugated layer. I "painted" a light coat of Gesso on the cardboard with a finger and let it dry. Mix a little mica with some water and brush onto the dried Gesso for a bit more color and sheen. Thanks for stopping by the Mixed Media Supplies bog today.... hope you'll join us again soon and don't forget to nurtured your creative soul as frequently as possible. And if you have a little free time, feel free to stop by my blog for additional ideas and creative endeavors.